Taking the Train to London, or Adventures in Choice | Notes from the U.K. I took the train to London. That shouldn’t be the opening sentence of a tale, but bear with me, because I had choices to make. Arrival time. Okay, sane enough thing to choose, but arrival time wasn’t so much about the time I needed to be in London but how much time I needed to allow for delays so I could be sure I’d get to London by the time I needed to be in London. Train problems? Let’s say half an hour. Tracks? Same. Signalling problems? File that with tracks. No floods at the moment. Someone throwing themselves on the line? Hours. Everything stops while the police do the whole crime-scene routine and finally release the train and its traumatized driver to finish the run. Wild Thing and I were on a train once when this happened. After that, it’s something you calculate. Or decide not to calculate, which is what I did. I’d take my chances. Irrelevant photo. 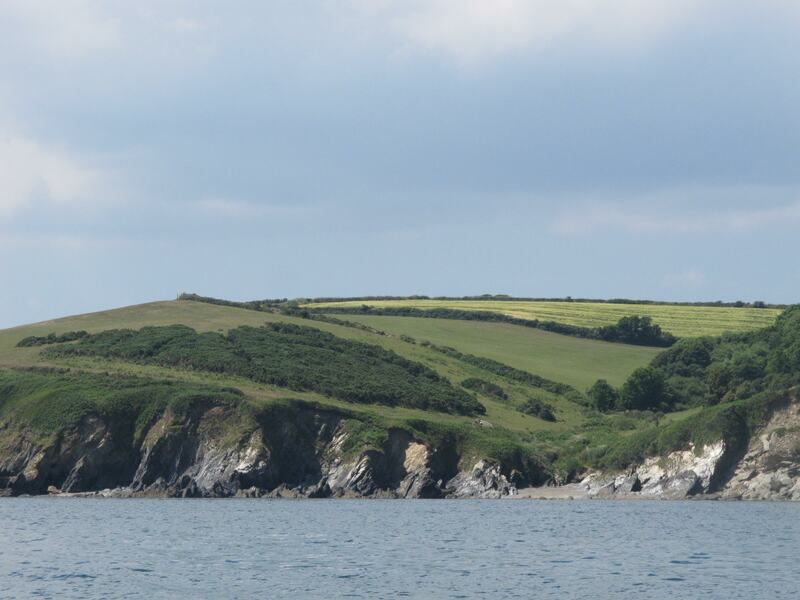 The coast near Fowey, Cornwall. Having weighed all of this and chosen a time, I had to choose a website. Google offered me over 40 million results. I confess, I didn’t check them all, but every one of the promotions I did read claimed to be cheap, cheapest, cheaper, or more discounted, better looking, and thinner than all the others. I compared. I contrasted. I did my best impression of a careful shopper. But this wasn’t just about comparing sites, because trains on a single route are priced differently. Why? Because the train companies want to make us crazy. Not to mention because finding the cheapest possible ticket is a full-time job and most of us don’t have the time and dedication, so—hmm; they wouldn’t be making money from making us crazy, do you? Anyway, the question wasn’t just what time I wanted to be in London, allowing for as many delays as I was willing to allow for, but how much I was willing to pay to arrive at the time I wanted to arrive, or how willing I was to get there earlier or later if I wanted to save a few quid. On the train I chose, the 11:40, the cost of an advance ticket with no rail card ran from £46 to £46. I was grateful to have done my comparison shopping, because it was going to save me big bucks. That was, of course, before taking into account that many of the web sites charge for using a credit card, using the web site, using your own keyboard, and breathing air. I bought my ticket from the train operator, First Great Western, which is what I would have done if I hadn’t done my comparison shopping. Another confession here: I do have a rail card, and I use it, which reduced the cost of the ticket by quite a bit. It had damn well better, because I have to pay to have it. But that’s a whole ‘nother story. I made more choices: Quiet coach? Noisy coach? Morris dancing coach? Forward facing or rear facing seat? Aisle or window? Inside out or upside down? Enter your credit card details and prepare to be boarded by pirates. My tickets came the next day. On the day I was traveling, I left an extra half hour to get to the station because I live in the country and it’s easy to get caught behind a tractor or a herd of cows. I got caught instead behind a garbage truck, which is less romantic. It lumbered its way along the highway at ten miles under the speed limit, but eventually I found a straightaway and passed. But in Exeter, traffic was backed up to—well, it was backed up to where it’s always backed up to and I thought I’d allowed for it but I hadn’t. If you miss your train, you can always buy a last-minute ticket for the next train, I told myself. This was supposed to spread inner peace throughout my being, but I’ve read about the cost of last-minute tickets, so it didn’t. No one understands the pricing system, but we all understand that buying last-minute tickets is insane. Everyone complains and agrees that we’re getting ripped off. I fretted about the traffic, reminded myself that I could buy a last-minute ticket, fumed about the cost, bumped forward a few car lengths, checked the time, rehearsed parking problems I hadn’t had yet, and generally enjoyed my tour of Exeter. Which, if you’re in the mood for it, is a beautiful city. I wasn’t in the mood. It was ugly. At the station, I used a phone-in/credit card system to pay for my parking. The alternative was to plug the machine with more coins than any normal human is physically able to carry. The phone-in system gave me another choice: I could pay for 48 hours and be pissed off because I needed—allowing for brake problems and signal breakdowns on the return trip—let’s say 28 hours, or I could pay for 24 hours and risk a ticket. I wasn’t offered the choice of 24 hours plus four. Having chosen to measure in days, I seemed to be stuck measuring in days. I paid for 48 hours was pissed off. I had ten minutes before the train was due and stopped at the departures board. Where I didn’t find the 11:40. Now, I raise numerical incompetence to the level of high art, so the night before I’d checked the departure time on my ticket at least three times. It might have been more. I don’t really trust myself to remember the number three. Still, I was almost sure my train left at 11:40, but there I stood before a board listing exactly two London trains, and one at 11:55 and the other was at 12:13. Fine, I thought. Either I’ve mixed up the time or it’s been rescheduled. Just get on the 11:55 and don’t worry. And even as I heard myself think that, I remembered newspaper articles about people catching the wrong train for one reason or another and having to pay the full, absurd, last-minute fare as well as a penalty fare. Punch “wrong train ticket” into Google UK and you get 3,480,000 results. Approximately. The 8 or 10 thousand (okay, the 1 or 2) that I checked personally are testimony to how intricate and incomprehensible the system is. People write in and ask, “What happens if I catch the wrong train?” and are warned about penalties and unpaid fare notices and the possibility of prosecution. Do not get on the wrong train, the saner part of my brain warned. It’ll be fine, the other part said. I’m always being taken for a tourist. I’m expected to be an idiot. The last two statements were true—my accent is unchangingly American—but the first was not, so I thought I’d ask the man at the ticket barrier about my train. He’d helped me and half a dozen other people get through when we put in the wrong ticket and the barrier didn’t open. You should understand that every passenger gets two tickets, and they look almost identical, but only one of them opens the barrier, so it makes sense to pay someone to stand there to keep people moving through. Sort of. I seem to remember reading the privatizing the trains was going to get rid of inefficiencies. And give us choice, which is a good thing because it gives us choice. But those are serious issues, so never mind. Before I had time to bother him, I spotted another column of numbers on the board. Numbers are like that for me. They can be right in front of me and stay invisible. The new column was the time the trains were scheduled, and there was my 11:40, delayed until 12:13. I left the man at the ticket barrier in peace and made my way to track 5. Which I checked twice, although the London train’s always at track 5. The later train, the 11:55 pulled in, but those of us who were booked on the 11:40 couldn’t get on without incurring the wrath of First Great Western and of the Great God of Railway Tickets, who is an angry god and afflicted with obsession-compulsive disorder, so lo, although we looked on longingly, we waited. The train doors closed. The train sat. It sat a while longer. A man got off, pursued by the angry and, I should mention, invisible God of Railway Tickets. “I got confused,” he said to the milling crowd. He was not fined or penalized or beheaded, presumably because the wheels hadn’t yet turned. I have no idea how he found out he was in the wrong train. Maybe he tried to claim his reserved seat and found someone else had a better claim. A couple with tickets for the later but earlier train—that’s the 11:55 in case I’ve confused you as much as is appropriate to this tale—appeared but weren’t allowed to board because the doors had closed. The platform guard told them they were required to be on the train two minutes prior to departure. They argued: They’d used the elevator that allows the disabled to cross the tracks, and it was slow. It is slow. I’ve used it when my partner was recovering from ankle surgery. “The doors close two minutes prior to departure,” the platform guard said. The train started to roll, ending the argument. They now had two useless tickets. They could return them for a refund, minus a booking fee, but they couldn’t use their tickets on our earlier but later train because they weren’t for that train. They either had to go home and forget the whole thing or buy two outrageously expensive last-minute tickets. Thank god privatization freed us from the stranglehold of bureaucracy. I don’t know what they did because I headed for the café, where I bought a cup of tea to take on board, because the café on the platform gives you a full cup but if you buy it on board a full cup is too dangerous—you get about three-quarters. I passed a man whose tee-shirt said, “Forever Delayed.” I figured him for a regular rider. Our train pulled in. My seat was in the last row, just in front of the train manager’s compartment, so I got to eavesdrop on the conversation when a woman knocked on the door and asked if he’d sign her ticket so it would be accepted on a later connecting train. He did. What would happen, I wondered, to all the people who hadn’t ask him to do that? Maybe, knowing a train was delayed, the train managers would be kind. And maybe not. Maybe since the system is now broken up, they wouldn’t know that a train run by another company was delayed. Two women ahead of me began a cross-aisle conversation about whether one of them would get to Gatwick in time to catch her flight. She was Spanish-speaking, and I got into the conversation half to help out and half for the pleasure of speaking Spanish. Her connection was tight and she was worried. I knocked on the train manager’s door, and he talked her through the two trains she could catch—one direct but later, the other a involving a transfer but earlier. He recommended the later, easier train, but she was too worried about her flight to take the risk. We discussed platforms and staircases and the name of the stop where she had to change trains, all in a mixture of English and Spanish. Mercifully, we the gaps in our vocabularies didn’t match. Although she lived in Spain, she was from Colombia and her Spanish was as beautiful and easy to follow as any I’ve heard. She was also extremely tense. If she missed her flight, her ticket would turn to ash. The train manager printed out two bits of paper that looked like cash register receipts, detailing her route. I asked if he needed to sign her ticket and he said no. I didn’t ask if he really needed to sign the last woman’s. After the Colombian woman left the train, I got into a conversation with the man in the seat next to me. He lives in Plymouth and his wife travels to London for two days each week. He’d become a ticket geek, he told me. The cheap tickets are released twelve weeks ahead of time, so he’s up early on Saturdays to buy one before they sell out. We’d both read that it’s sometimes possible to lower the cost of a trip by booking separate tickets on a single train—Exeter to Reading, say, and then Reading to London, all without getting off the train. He’d never gone that far. It’s a system that begs you to make mistakes. I’d end up putting myself on different trains, or on the same train on different days. “Choice,” he said, shaking his head. It is indeed a wonderful thing. This entry was posted in Driving, Other Stuff and tagged Americans in Britain, Americans in England, anglophile, Britain, British trains, Cornwall, England, longreads, privatization by Ellen Hawley. Bookmark the permalink. I should pass this along to my husband who commutes daily to work. He thinks HE’S got it bad. On the other hand, I don’t have to do it five days a week. Geeze. When I visited you in 2010 (? ), I just ordered a ticket from Great Western on line, from right here in Minnesota and you cautioned me to use the same credit card at the station, which I did. The scene at the Paddington Station was confusing (not because of the small stuffed bears everywhere though they constitute a mighty distraction) and Scott pretty much pushed me into the proper line but once on, I just read and stared at grass and sheep. You plunked me onto the train on the way back, we waved wistfully, and there were only two challenges – (1) a very boring man who wanted to talk the entire trip and (2) one transfer which was tricky because there was only about 2 minutes to accomplish it. I did and ditched the boring man for a two-fer. If I had to negotiate the system you describe, I’d likely go nowhere. Fast. Wild Thing’s rule of talking to people while traveling is Only engage when you’re about to leave. She misses out on long conversations with wonderful people but doesn’t get trapped by bores. After reading that I need a drink! I think they sell those on the train, although I can’t swear to that. You might have to settle for tea–about three-quarters of a cup. On a positive note, that being England, the tea won’t arrive in a little bag on a saucer next to a cold cup and a pot of warm water. Thanks for a good laugh, Ellen. Though my journeys are usually two buses and two trains – so I shouldn’t be laughing. Love the irrelevant photo. Think my blog needs some more irrelevant stuff! I think it’s a brilliant idea. Hope you won’t mind if I imitate you. This is a great read, and I can feel your pain, yes. I, too, tried to be clever and buy a cheap ticket in advance, and after I drew the balance, I had paid more than the usual full price. I love your style, makes me look forward to reading your books. Thanks. I love hearing that. Not that the ticket cost more but that you look forward to reading my books. My goodness! During my brief stay in London in ’05 I only travelled out of the city once, to Swindon. Had all this been going on (perhaps it had, but I was just blissfully unaware) I’d never have done even that. I simply pitched at Paddington, bought an open return ticket from the machine and got on. Common sense tells me that’s how it should work all the time. Choice. Ha! I should probably have said that this wasn’t an entirely typical trip–which is what made it fun to write about. But the insanity with the tickets? That’s typical. I’m pretty sure an open ticket’s more expensive than one you buy ahead of time for a specific train. Why? As the kids on my block used to say when rules were as inflexible as they were inexplicable, just because.